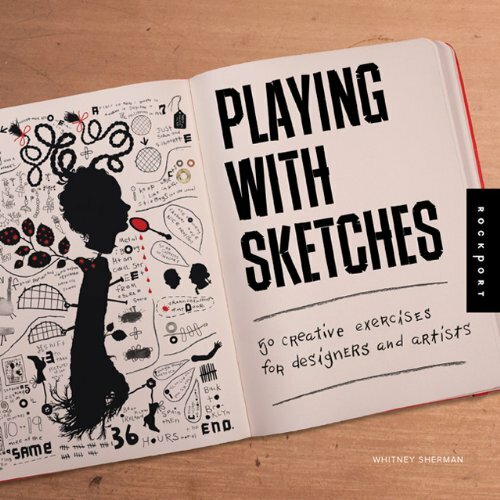 Playing with Sketches is a collection of fun drawing exercises and projects designed to keep your hands moving, and minds wandering. There are 50 activities in all, each one's a chapter by itself. I like this type of books because there are just so many things you can try out. The author is illustrator and educator Whitney Sherman (website | twitter). The book starts with simple drawing exercises, such as drawing parallel lines, creating textures, playing with shapes, patterns, or even using smoke to draw, and others. The latter part features more ideas and projects you can work on. Some of them would be like drawing things you see on the way home, having a different theme for your drawings each day, getting creative with using typography, collaborating with other artists, and many more. Every activity comes with easy instructions and oftentimes some background on the techniques and history. They are accompanied by various examples of the same theme by other artists, and many artists featured so there's a good variety of styles to look at. It's a book you can pick up, flip to any page, and get some ideas and inspiration for drawing. You can find new ways to use media, see things from a new perspective, and use the ideas and activities as springboard for further experimentation. Recommended to to artists at all levels. There are several publishers for this book, so the cover art might be different. Seems that in Asia, it's published by Page One Publishing, and elsewhere it's by Rockport Publishers. If you're looking for similar books, I would also recommend Freehand: Sketching Tips and Tricks Drawn from Art by Helen Birch, Just Draw It! and Keys to Drawing with Imagination.